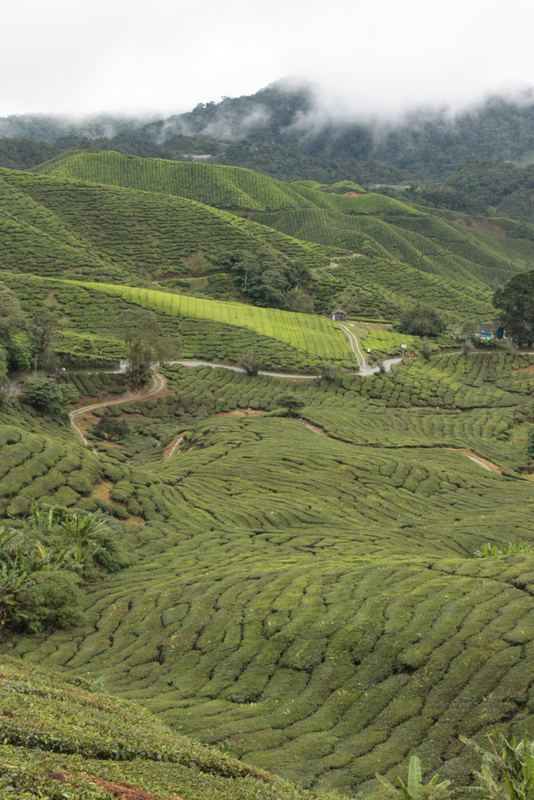 I was quite looking forward to the bus ride up to the Cameron Highlands, envisaging a slow drive along winding jungle paths into the green, misty hills. This was before I had experienced driving in South East Asia however, having only had a little taste of crazy motorists in Kuala Lumpur which I had incorrectly passed off as a consequence of their being in a hot, over crowded city. As soon as we left the confines of the city’s outer suburbs, the speedometer on our mini bus to the Highlands began to slowly but steadily creep up and up. I should have guessed what we were in for when the driver asked if we could move as far forward as possible before we began to head into the hills but was too engrossed by the passing scenery to put two and two together. 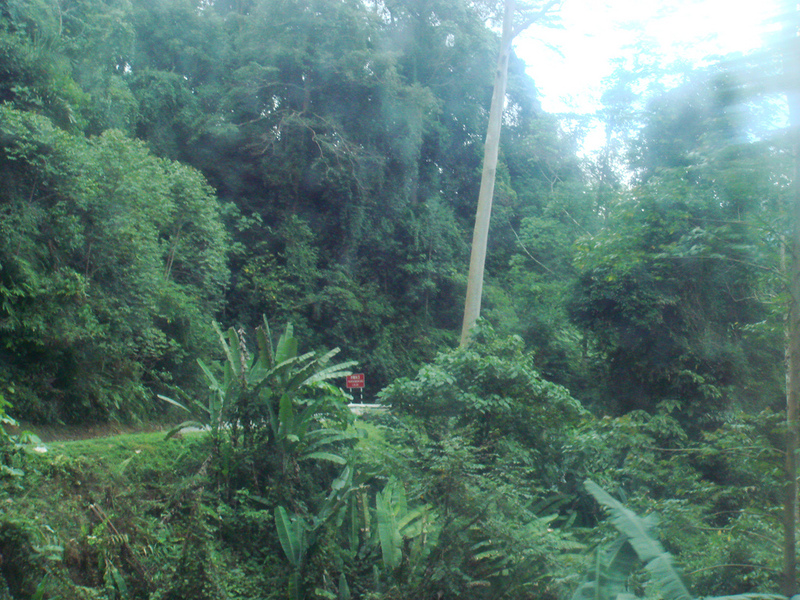 Dreams of a slow amble into jungle territory were quickly shattered when the bus began to tear up the spiralling roadway, overtaking anything else that happened to be on the road, and screeching recklessly around corners. I’m usually quite a relaxed passenger and very rarely get travel sick but after 30 minutes of this, my face started to mimic the colour of the green hills and I had to ask to stop for a break. It’s a shame, because the view was spectacular and it would have been nice to have spent more than a brief moment hurtling through the more undisturbed areas of the hills, which are still inhabited by the people of the forest, also known as the Orang Asli (‘original people’) or the Orang Kita (‘our people’). 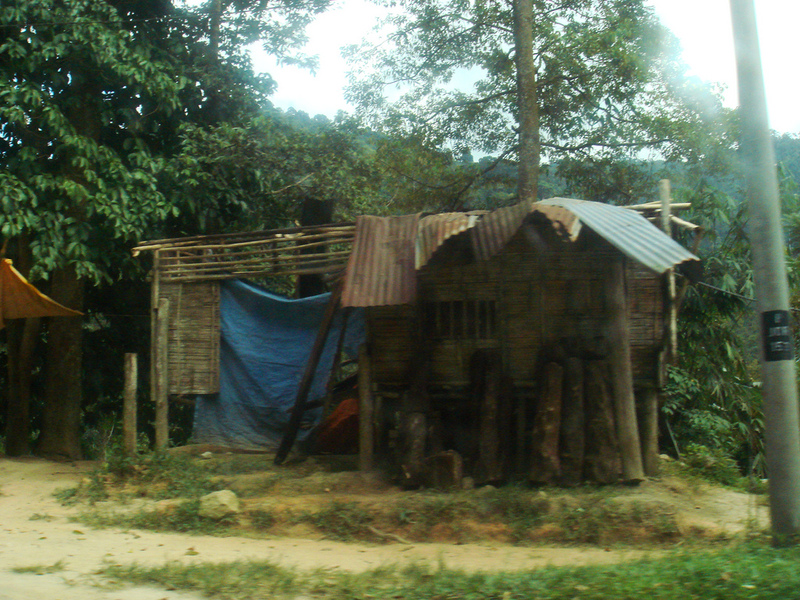 With the sudden burst of colonial era development in the form of tea plantations and highland retreats during the early to mid part of the last century, the Orang Asli were constantly pushed off their land. 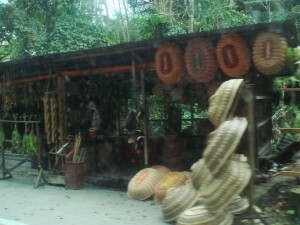 They have since grouped together and managed to retain some land and rights and clusters of their stilted forest huts (many of which now sport satellite dishes) can clearly be seen from the jungle road which leads to Taman Negara and Tanah Rata, along with a handful of the wooden stalls from which they sell honey, woven baskets and other forest goods. As the Malaysian government continues to encourage development (particularly tourism and business related), the rights of the Orang Asli continue to come under fire. There are organisations such as the Center for Orang Asli Concerns monitoring the situation but the issues facing them seem far from being resolved at present. 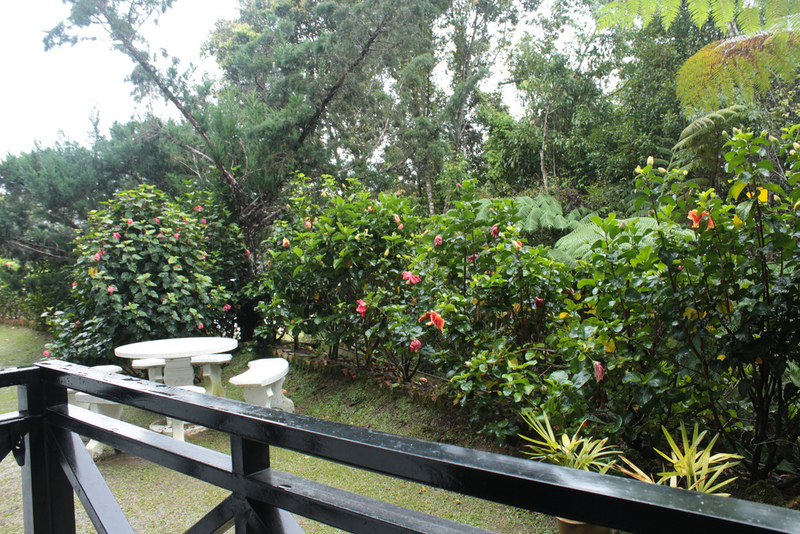 After what seemed like the longest drive I’d ever been on, we finally reached Tanah Rata and made our way through the notorious highland rain to our accommodation. We’d tried to book into a hostel that we’d read about called Father’s Guest House, but the church which owns the land the hostel was on had recently decided to take it back and so we were taken to their other guest house, Gerard’s Place. It was about 10 minutes walk from the town and was located in a complex of mock Tudor buildings, slightly reminiscent of an Austrian ski chalet village. Jay, our host, was very welcoming and gave us many good tips on local walks and wildlife. She was part of a local environmental group called REACH (Regional Environmental Awareness Cameron Highlands) who not only aim to educate and inform the local population about current environmental issues but also actively monitor local problems such as increased pollution levels in rivers due to farming run-off. They are a very impressive grassroots organisation and also serve as a refreshing example of what people can do when they group together for a cause. The guest house itself was a very relaxing base from which to explore the surrounding area. In true highlands style, it was very wet but we decided to take a trip to the ‘BOH’ Sungai Palas tea plantation, which is one of the oldest in the highlands. I had seen pictures of tea plantations before but was not prepared for just how extensive it was. Despite being a man-moulded landscape, I couldn’t help but find it beautiful – especially when the mists rolled gently over the hill peaks. 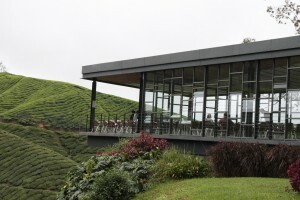 The walk through the plantation may have been damp (though strangely this didn’t deter a wedding party whose bride and groom were being photographed, posing among the tea hedges), but the café at the end was definitely worth the trek. 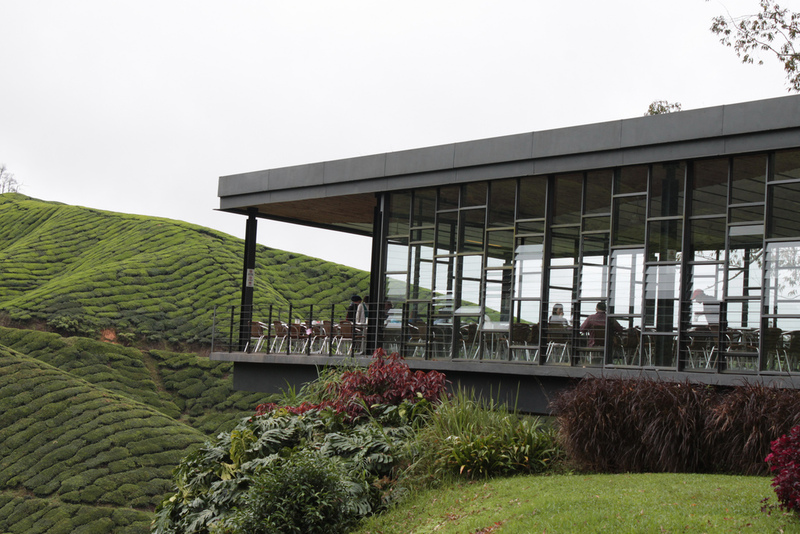 The ‘BOH’ tea café overhangs the plantation from an elevated height, providing spectacular 360 degree views of the rolling hills. The choice of teas was fantastic and unlike KL, there wasn’t a condensed milk carton in sight, which made for a welcome change. This, in combination with the damp weather and scones with local strawberry jam almost made me feel like I was sitting in a countryside café back at home. This thought was soon interrupted however, by several small dots which came into vision, moving around the hedges, dragging huge sacks of tea leaves behind them. A couple appeared to have clippers, which is a now old fashioned method of tea picking and has become increasingly rare in recent years thanks to the introduction of electric, tea-stalk-cutting strimmers. Some locals argue that this has h ad a negative impact on the taste of the tea but as the pickers are paid by the kilo (and at only 20 cents per kilo), you can hardly blame them for making use of this newly available machinery. 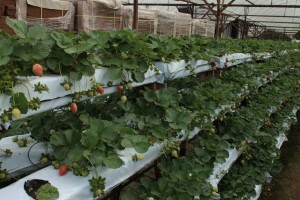 A local man, whose mother had been a tea picker some 20 years ago, told us that there are no longer many Malaysians working on the plantations as the owners prefer to employ cheaper foreign labour from Indonesia, the Philipines and Nepal. The workers are usually signed up for a minimum of two years, during which time they live in huts (pictured above) in the plantation grounds. The tea harvesters we met seemed in good spirits – perhaps working in such lush, green surroundings helps – but there’s not doubt that it’s hard work which it’s easy to forget about when buying mega packs of tea bags in the supermarket (most of which incidentally contain cheap tea dust rather than actual tea leaves). The next day brought even more rain than the day before but as it was our last in the highlands, we decided to make the most of it by hiking along one of the jungle trails to the Robinson falls. We had been tempted to embark on a longer walk in search of a Rafflesia (the largest known, and perhaps worst smelling, flower in the world) which was currently in bloom in the highlands, but after a couple of disappointing reports from other trekkers who had returned to our accommodation drenched, covered in mud and pretty miserable, we decided to forego it in favour of the easier path. 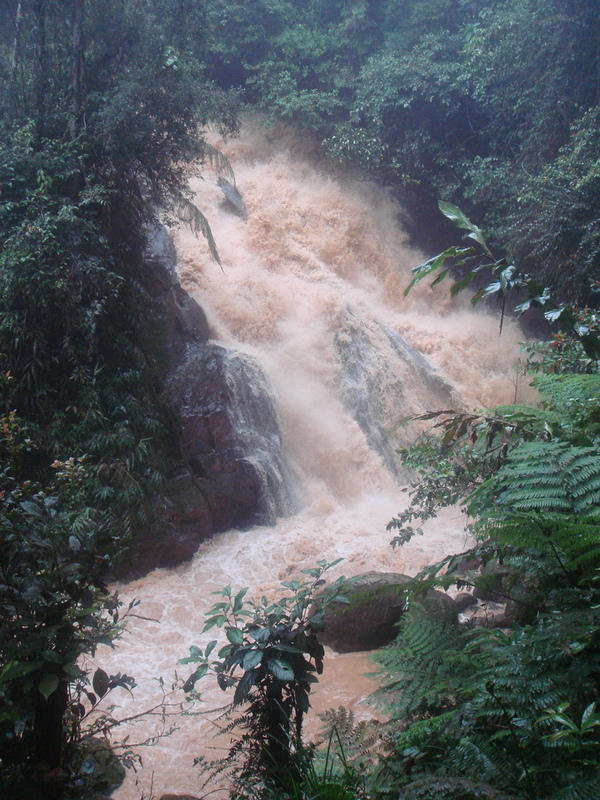 The river that runs through Tanah Rata had started to swell and was running furiously alongside the jungle path, its banks barely containing the strong earthy-brown current. The walk snaked by some of the infamous highland strawberry farms, as well as several home made jam stalls before turning into a more densely forested area where the rain mists thickly gathered at canopy level. After crossing several bridges and shallow streams, we reached the falls which were thundering down a ravine. The town of Tanah Rata was only about 20 minutes away on foot but this felt like a different world, one through which elephants and tigers used to freely prowl. Sadly, as the human presence increased in the highlands, their habitat quickly diminished and in 1974 an elephant trans-location group was set up to move any ‘problem’ elephants away from the highlands, to various national parks and sanctuaries. Some say that the highlands lost something when this was allowed to take place and that wild beauty was sacrificed in favour of the creation of a sort of controlled tourist park atmosphere (something which the British undoubtedly had a hand in creating – many of the highlands’ villas still bear the unmistakable marks of the British penchant for clipped lawns and manicured gardens). As long as there are groups such as REACH campaigning against further deforestation and unnecessary development however, I can’t help but feel that the highlands still stands a fighting chance. 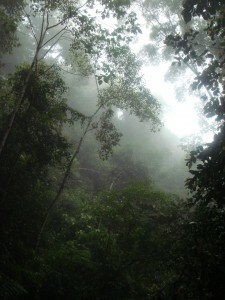 This entry was posted in Travel and tagged Cameron Highlands, Environment, Malaysia, South East Asia. Bookmark the permalink. Another hair-raising journey! 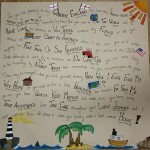 Thanks for taking the time to find out about the environmental issues affecting the areas you visit and for sharing. 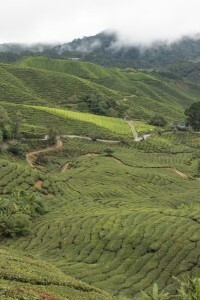 The Cameron Highlands look beautiful and long may they stay that way. 20 cents per kilo? Remind me not to complain about fruit picking in Australia again (or at least not to complain so much).